The PumpHouse Theatre is delighted to have renowned NZ actor Rawiri Paratene (Ngāpuhi) joining us in September for Kōrero Pūrākau – Māori Storytelling. 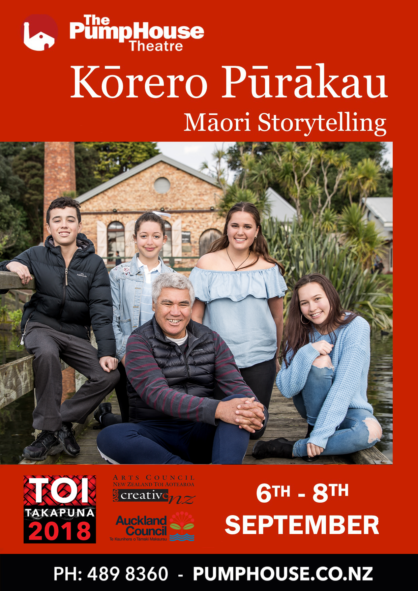 In the role of story-teller, Rawiri will share traditional Māori myths and legends alongside young local actors Zebion Te Kauru, Giorgia Doughty, Skye Murphy and Ivy Pondman-Carmont who will interpret and re-enact the stories. This will be a bilingual Te Reo Māori – English production especially designed for primary school-aged children with daytime shows available for school and EEC groups. Kōrero Pūrākau is timed to coincide with New Zealand Theatre Month and is the final production in our year-long season of Māori Theatre, known as Toi Takapuna.